Takata has designated no successor to Takada, pictured. 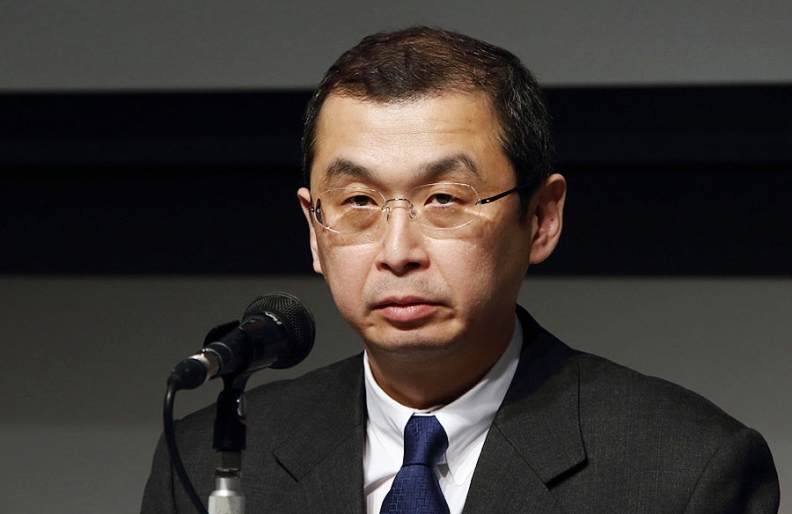 TOKYO (Reuters) -- Takata Corp. said today that CEO Shigehisa Takada had no intention "as of now" to resign as the airbag maker struggles with a long-running safety recall crisis. In a brief statement to the stock market, Takata said it had not announced Takada's resignation and "as of now he has no intention to resign." Citing two people close to Takata, Reuters earlier reported that the supplier would tell its automaker customers at a meeting today that Takada, grandson of the group's founder, was willing to step down and take responsibility for the recalls. "There are plans for management reforms," said one of the individuals, adding this would involve expressing the willingness of Takada and other executives to resign. The sources said Takata has not taken any formal decision on Takada's future and no successor has been designated. The company confirmed the meeting to update its automaker customers, but said it had nothing to disclose following those talks. The company apologized to customers and investors for "inconveniences and uncertainties" from the recalls. Pressure has been building on the Tokyo-based company for almost two years over defective airbags that can explode with excessive force and shoot shrapnel inside the car - a problem that has ballooned into a crisis affecting tens of millions of cars. Takata said on Tuesday that an 11th death could be linked to a faulty airbag. At today's meeting, Takata was expected to outline its plans for supplying replacement airbag parts to its customers, the sources said. As part of that, Takata is looking to team up with Daicel Corp. to make airbag inflators, people familiar with the matter have told Reuters previously. Tetsuo Iwamura, executive vice president of Honda, which has been hardest hit by the airbag crisis, said he attended the meeting with Takata. He offered no further comment on those talks. Takata may come under renewed pressure when Germany-based Fraunhofer Institute reports on its investigation into the causes of airbag inflator failures. Japanese media have reported that the findings, commissioned by Takata, are due in the coming weeks. Partial results of its inquiry released last June showed that the airbag explosions appeared to result from damaged or improperly assembled inflators, and when ammonium nitrate, the chemical compound used to inflate the airbag, came into contact with moisture, a particular concern in humid regions. Takata said then that it was still unclear what the root causes of the airbag failures were. If the final report finds Takata liable for defective airbags, it could leave the company with a recall bill already estimated at more than $3 billion. Automakers, including Honda and Toyota, which have been paying for replacement airbags, could also take it as a cue to cut off financial lifelines to Takata. Takada, 49, joined the family business straight from university in 1988 and has been CEO since 2013. He has been widely criticized for keeping a low profile even as the airbag crisis escalated, and automakers accused Takata of mishandling and manipulating safety data. In his first media appearance in June 2015, more than a year after the recall crisis erupted, Takada apologized for the defective airbag inflators, saying that staying on to lead the company was the appropriate way for him to take responsibility.